Below is an account by Father Nektarios Antonopoulos, the Abbot of the Holy Monastery of the Transfiguration of Christ - Sagmata, about his meetings with the Gerontissa (Eldress) Nantieznta on his trips to Simferopol. Fr. 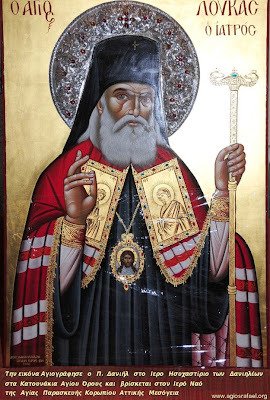 Nektarios has written a lot about St. Luke Archbishop of Simferopol, has helped the Monastery of Sagmata become a pilgrimage of St. Luke in Greece, and also has visited the Ukraine many times leading pilgrimages. These are some comments of his about a very spiritual nun who was and remains under the spiritual direction of St. Luke. The text is an amateur translation from: http://www.agiosloukas.org/nantienznta.html and http://www.agiosloukas.org/nantienznta1a.html. 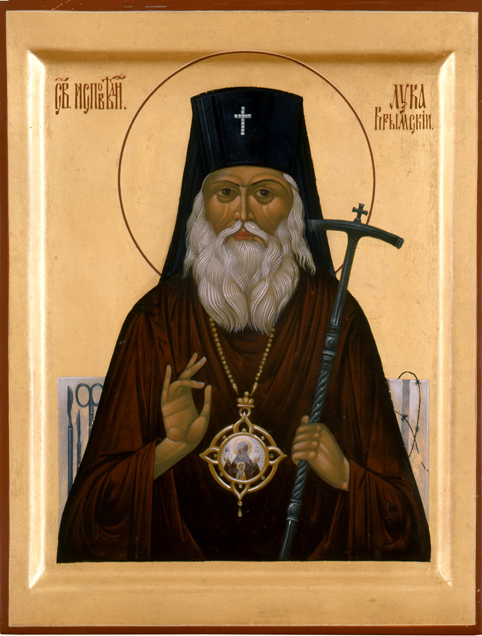 "It was June 10th 2000, the eve of the celebration of St Luke the [Surgeon], Archbishop of Simferopol and Crimea. I was in the church of the Holy Trinity in Simferopol for the festival Vespers and Matins. Among the thousands of pilgrims I saw an elderly Great-schema nun. From the first moment I was impressed with her presence and kindness. Her relatives related to me that Gerontissa was a spiritual child of St Luke. I saw her again the following year in Sevastopol. We talked a little more and I began to understand that this was a spiritual treasure, but unfortunately I was unable to stay longer. I bid her farewell, saying that if God wills, next year we will meet at her home. Indeed in June of 2002, I visited her residence on the ground floor of an old building. The small apartment consisted of a room connected by a narrow corridor to a small kitchen, small and unadorned [ανήλιο και απεριποίητο? ], in a terrible state, as well the rest of apartment. Gerontissa lives with her daughter and granddaughter. The wall above her bed was covered with icons, and in the center was a table with an ever-burning lapada [olive-oil votive lamp]. She welcomed us full of joy: «Welcome! What a great blessing this is, that you came to me the sinner...». She took a single orange from the table and gave it to me. «I saved it for you.» She continued. «You know a month ago I was very in very bad shape. I felt my forces starting to leave, my blood pressure fell, and I understood that I would soon be leaving for that Great Journey. The priest came and communed me, but at some point I remembered your words and what you told me when you left. Then I entreated St. Luke and I told him: «My St. Luke, Fr. Nektarios said that in one month he would come to see me. If you want, let me live until then I can go. Indeed the Saint heard me, my strength returned, my blood pressure rose, and now I am well». I was surprised and somewhat uneasy to hear this, and I said: «But I also wanted to see you alive». Very charismatically she replied. «And I tried to live». I asked her about her life. «I was born in 1906. I lived through a lot in my life. Poverty, hunger, misery, revolutions, wars...». It's noteworthy that Sevastopol belongs to those cities which have especially suffered. Shortly after the October Revolution, civil war erupted between «Whites» and «Reds», which took nearly four years. Millions were the dead and many more the other victims and the injured. The most bloody phase of this war took place in the Crimea. Following the withdrawal of «Whites», the massacres reached their peak. Within one and a half months around 50,000 people were executed. Sevastopol lived through horrific days, and that is why we called the «City of the Hung». The central avenue was full of corpses. They gathered those that they had hung in the streets to terrorize the population, while the town was dominated by posters with the slogan «Death to traitors». In the Second World War, Sevastopol once again sawthe horrors of war. The location is of strategic importance and the two rivals fought rabidly and had countless deaths. Sevastopol was kept for 249 days and all the while mercilessly bombed. When the fighting stopped, only seven buildings were left standing, the rest of the city had been steamrollered. The Gerontissa continued: «Since early on we have experienced the horrors of civil war. I was a little girl and then our town lived through many misfortunes. There was a lot of blood spilled then. In the decade of the 1930s I got married and had two girls. Soon the Second World War erupted and my husband left for the front. The Germans arrested him as a prisoner and he was kept for some time in German camps. After the war the prisoners returned, but not to their homes; they were sent to Siberia. It was an absurd policy of Stalin. Those miserable Russian prisoners who survived the suffering of the German camps, were considered by Stalin to be poisoned by the «miasma of capitalism» and therefore should be subjected to the «detoxification» anti-Capitalist treatment. So in this way all the soldiers were driven to the gulag camps! I never saw my husband again. With great difficulty I raised my two children. My only consolation and hope was in faith in God. Since I was small I was in the church, and this supported me. Let His name be glorified». I met Saint Luke in 1951 and this acquaintance was the greatest blessing of my life. 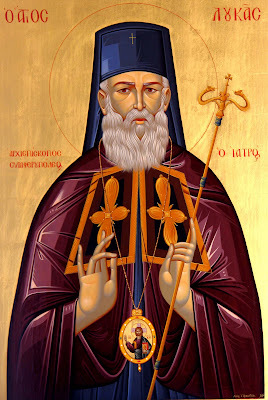 For ten years I made him the prosphoro [holy bread] for the Divine Liturgy, and I never missed his sermons. Many times I visited his office, and we would talk frequently and often we ate together. He helped us a lot, as long as the whole world. He often stayed hungry so that others could eat. But while St. Luke seemed austere, he actually wasn't. When you approaching him you saw a sweet man, full of love. All of us loved him and we thought of him as our father. Although the situation was difficult - the Church was under persecution and we were at risk of losing our jobs - we ran to be close to him and to listen to the sermons. And when the Divine Liturgy was finished, we did not leave, but we waited for him and then followed him up to his house. When we would reach his home, he turned around full of love and blessed us. When my daughter was small, she had a problem with appendicitis and the doctors had recommended surgery. I went to St. Luke, he examined her and told us: «No, do not do surgery, there is nothing». Indeed, since then it did not bother her again. I remember that I saw him a few days before his dormition. He was in his bed, very weak, and he couldn't speak well. He only whispered something to me and I received his blessing. I was present at his funeral. The two evenings when his body remained in the church I was there and I read the psalter. The second evening, as I read the psalter, I saw him in front of me, very much alive. He sat down not too far away at a table. I was speechless. On the day of the funeral there was a great battle with the police, and we were not allowed either to bring the Relic along the main road or to sing. We will not forget the following amazing fact: When we were having the argument with the police over his coffin, there appeared in the sky thousands of doves which circled and chirped. Everyone followed St. Luke on the main road to the cemetery. This took approximately three and a half hours. All this time we were chanting «Holy God...» and the doves followed us. When we arrived at the cemetery, the doves sat on the roof of the church. After we finished and started to leave, the doves flew away chirping, and no one ever saw them again. There were thousands of doves and this made a great impression. This was even striking to the «atheists». The exhortation of Christ came to my mind, how we must become like children and admire their simplicity and directness. «I was tonsured in 1997. For a long time I wanted to become a nun, but was not provided with the opportunity. Eventually, my desire was made known to the Metropolitan, Lazarus, who gave me the blessing to be tonsured. I didn't go to a monastery, because there is none nearby. Furthermore I am very advanced in age, and so I decided to stay here. I split the room in the middle with my daughter (and showing me her bed and icons, she continued) from here is the monastery, and (showing the bed of her daughter across) there is the world. My day passes with my prayer. What else should I do? I am a nun. Before, all day I would read many Paraklesis [Supplications services] and Xairetismoi [Salutations services] to the Panagia. Now I see almost nothing, nor do I hear well. My daughter reads to me, and the rest of the time I do the komposchoini [prayer rope]. I did the same at night, because I cannot sleep much. I pray: «Lord Jesus Christ, have mercy on me the sinner». I pray to our Master for priests, for our monks and for the whole world. I also pray for you that God keeps you well. She stopped for a moment and then continued: «You know, today I am very happy but also very sad. Tomorrow is the Ascension and our Christ will leave us. I am glad that he will ascend into the heavens, but again I am sorry that he leaves ... I wanted Him to stay!. But whatever happens I will leave myself, I am now useless. I shouldn't weary them and pester them». In October 2003 we visited again with a group of children from the Diocese of Thebes and Levadeia. The small room was packed, and most could not even fit in the room, but remained in the corridor. The Gerontissa's joy was very great «What a great joy you've given me. So many people came to me! Thank you for remembering me. You came to me like little birds from heaven, like angels». He accepted, and so we took the boy home and kept him for three to four years. Later, some relatives of his from Vynitsa were found from very far from here, and they took the child with them. Unfortunately now we have no contact with the child. They didn't take our phone number and haven't sent us a letter. Never mind, may things go well with the child, as God keeps him well. We could do this and we did». We admired her nobility. The soul which knows how to love, to offer and to sacrifice does not complain for any ingratitude, or require any permanent dependency from others [ούτε απαιτεί την μόνιμη εξάρτηση του άλλου?]. The second incident is similar. «One relative of ours was pregnant. Because stumbled financially, she decided to have an abortion. We entreated her not to do so. She was adamant. She said that she would not be able to raise it. I fell to her feet, and I begged her with tears, saying that she would be committing a crime, she would be killing a human being. She did not change her mind, and then I said that since she could not raise it, she should give it to me, I will adopt it and will raise it. This convinced her. The child was born and we brought her home. Today she is 14 years old». She appears to be a very good and willing girl, who lives as a gift of the love of her holy grandmother. The remarkable thing is that Gerontissa Nantieznta is not only not rich, but gets a pension of hunger [παίρνει σύνταξη πείνας, government subsidy for food?]. Only six euro per month and a similar amount from her daughter. Thus little Anna grew up in Gerontissa's house. The money is not enough to live, but the Gerontissa is totally devoted [απόλυτα παραδομένη?] to the will of God. We sat close to her for over an hour. Her smile was constant on her lips and her words were an outpouring of joy. We did not hear any complaints, only glorification of God. Her countenance was filled with love and kindness. Her eyes could see little, but the eyes of her soul were wide open. 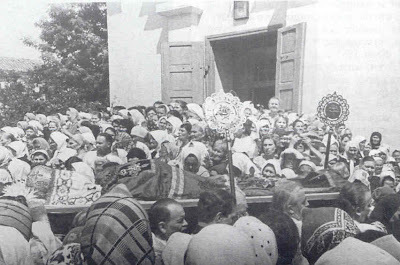 In her hands continuously spun the komposchoini and every so often she would whisper the Jesus Prayer [«Lord Jesus Christ, have mercy on me the sinner»]. As we were leaving she filled us with prayers: «Go in prayer of God and the Panagia. May your guardian angel be with you. May St. Luke be near you. Write me your names and your city, that I may pray for all of you and your families. 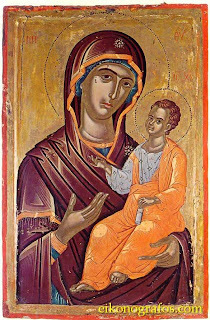 Now that you are leaving, I will do the Paraklesis to the Panagia Odigitria ["The Directress"] that she might guide you, and go on the road before you». ...She asked her daughter to help her outside to bid us farewell. She sat at the door and with tears in her eyes she crossed us and continued prayers. «May your guardian angel be with you. May Panagia the Odigitria be your guide». One hour near her was a taste of Paradise." St. Luke Archbishop of Simferopol, intercede for us all and help us!